Ever see a really good write-up on a business? Probably, but not frequently. You don't see it that often because most companies don't have access to such without a dedicated professional writing/advertising staff, or an expensive outside agency. Even if you have an especially talented writer, he or she does not always know how to best position you in marketing. It’s still worthwhile to engage our pros. Combine your knowledge of your business opportunities with our experienced building and construction industry marketing pros! Showcase your accomplishments and capabilities in interesting project case studies! 3) also as desired, full-color, two-sided, glossy prints with your award plaque image on the reverse side of the document, ready to use. Your right and ability to edit, reproduce and use the document lets you use and reuse it for multiple purposes (general info on your company, tailored to feature a specific past project, tailored to a specific service you are marketing or target customer or group of prospects including naming them in the write-up, updating over time, etc.) without incurring the costs of editing and preparation over and over. It is already professional grade, and now your staff has the skill set to change portions as needed to use it many times over, without additional expense. Note: If you want help adapting the write-up in the future, a Company Profile, or a larger, multi-page portfolio presentation, Pulse offers contract writing and publishing services on an affordable basis. 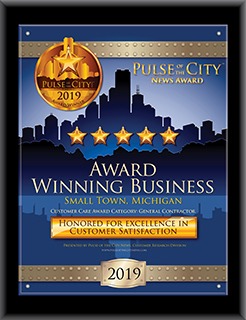 Please contact us at 866-732-9500 or customercare@PulseoftheCityNews.com. You can use your targeted write-up in brochures, handouts, mailers, flyers, supplements to presentation and RFP packets, etc. There is no better way to separate you from the pack than with a quality presentation!